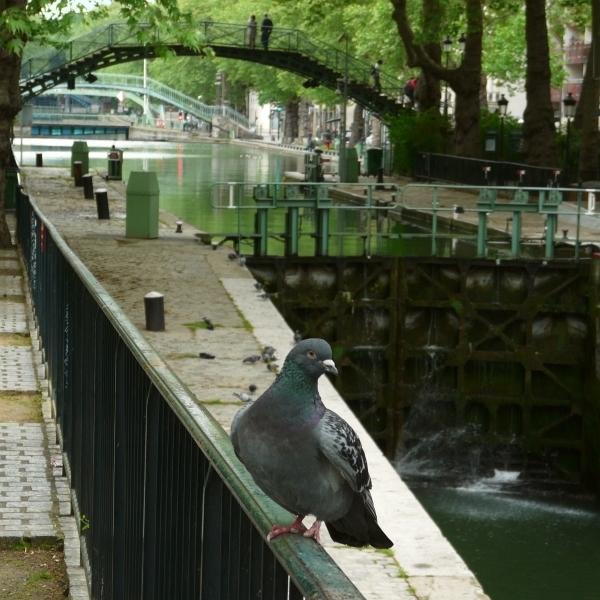 I used to live in the 19th arrondissement of Paris, overlooking the Bassin de la Villette, a neighborhood replete with cultural barges, movie theaters, breweries and more. When the weather is nice, huge crowds of people come hang on the canal to play boules and myriad other games, have jam sessions, et “pour prendre l’apéro”. But when the winter gloom sets in, the bobos vanish, and only a small, stalwart group of “boulistes” can be found along with your occasional jogger and dog-walker. And one other curious individual. I would spend a lot of time rehearsing or giving lessons at home during the week, particularly in the wintertime. Frequently I would stare out my windows at the dreamy landscape – the wind blowing through the rows of poplar trees lined up along the water that would sometimes ice over when it got extra cold. Seagulls, pigeons, and flâneurs in movement, all eerily in sync. I soon began to notice a strange daily ritual. Occasionally while on an afternoon walk or jog I’d even see it happen right in front of me. While on one of these jogs during which I was listening to the podcast Radiolab, a story came up about pigeons, how they have an amazing GPS system hardwired into their bodies, how they tap into the earth’s magnetic fields to guide themselves, and other aspects of their intelligence. It probably took a few different attempts before I found a match with some musical ideas I had a-brewing. I think I opted for a sort of a comical blues approach to highlight the comedy in all this. Process-wise, we went for resonator slide guitar married with a vintage electric fed through a nice tube amp, electric bass, dirty harmonica, drums played on a 70s era Ludwig, all recorded on an analog Studer tape machine. For that extra sheen, I got my Addis Ababa-based friend Kenny Allen to lay some golden background vocals. And there you have it! High time for Chapter 7!